Toyota Motor Corporation (TMC) played host to a glittering awards ceremony in Japan today for the seventh Toyota Dream Car Art Contest at the Mega Web vehicle experience centre. The Dream Car Art Contest was established in 2010 to encourage children to create their vision for a car of the future. A total of 30 children, from 24 countries and regions, gathered alongside their parents or guardians at the ceremony, with Gold, Silver, Bronze, Best Finalist, and special award presentations taking place. UK entrant Charlie Louise Sutherland, who entered through Helensburgh Toyota, was among the attendees, having impressed a panel of experts in the UK section of the competition with her ‘Underwater Nessie Adventure Truck’. Leading up to the awards ceremony, 30 winning pieces were displayed at Mega Web and visitors were invited to vote for their favourite – the entry with the most votes received the Mega Web award. Toyota President Akio Toyoda resided over the President Award, selecting an entry to be recreated as a 3D model. At the end of the ceremony, participants worked together to produce a carpet of flowers, inspired by designs of the three Gold award-winning pieces. Akio Toyoda’s selection will be displayed from the 2nd November until mid-December. 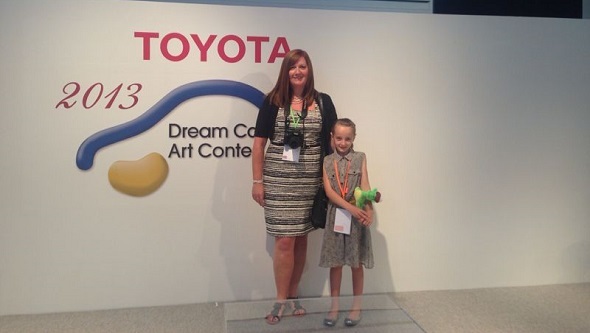 More information about the Dream Car Art Contest is available on the Toyota Global website.